They will join Irish guests who have achieved success across politics, sport, and music industries in the UK. 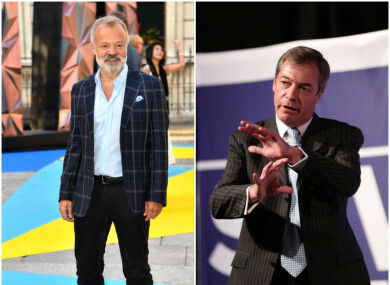 BBC PRESENTER GRAHAM Norton and former Ukip leader Nigel Farage are among the guests on tomorrow’s Late Late Show, which is being broadcast from London. The show will be broadcast from Central Hall, Westminster from 9.35pm tomorrow. The theme of the episode is the Irish in Great Britain, who have made waves in their respective fields. Brexit will be a big topic during the show, a statement said. As Brexit looms, Ryan will be discussing the potential fallout from Britain’s decision to leave the EU with avowed remainers including former Labour spin master Alastair Campbell and Dublin-born Liberal Democrat Baroness Dee Doocey and steadfast Brexiteers former Ukip leader Nigel Farage and economist, and Irish citizen, Liam Halligan. TV presenter Graham Norton will speak about why he left the UK, Brendan O’Carroll will talk about taking his show Mrs Brown’s Boys to Britain, and Laura Whitmore will chat about why the Irish have such a strong representation on the airwaves in the UK. Former Republic of Ireland player and manager Mick McCarthy will be telling Ryan what it was like to grow up as the son of an Irish emigrant at a time when Ireland was known for the Troubles, while former world champion boxer Barry McGuigan about how he became a symbol for peace and neutrality. Email “Graham Norton and Nigel Farage among guests on Late Late Show London special”. Feedback on “Graham Norton and Nigel Farage among guests on Late Late Show London special”.